Sleeping up to 8 each. Free off-street parking. Free wireless broad band internet access. 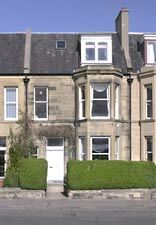 Stewart Thom's two apartments are on the first and top floors of a Victorian villa overlooking the playing fields of George Heriott's school with panoramic views of the full extent of Edinburgh's skyline. 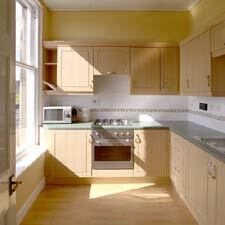 The apartments are affiliated to Heriott Park Guest House next door. Stewart says, "They are modernised and tastefully decorated, and can sleep up to 8 people each, but I recommend that to maximise your enjoyment, 5 is the optimum." The Royal Yacht Britannia is moored about a mile away and there are lots of pubs, bars and restaurants also within walking distance. There are buses every 10 minutes (journey time 10 minutes) to the city centre, which is less than 2 miles away. A Daysaver ticket gives unlimited travel in Edinburgh for £3.50. Alternatively, it is a pleasant 30 minutes walk via the nearby Royal Botanic Garden. The four photographs, right and below right, were taken in Apartment 2. Apartment 3 is very similar in design and furnishings. The layout and room sizes are slightly different as illustrated in the two floor plans below. Both apartments have a comfortable living room with 2 sofas (one of which is a sofa bed) and have a dining table and chairs in the window where you can take meals while enjoying sweeping panoramic views of the city skyline and Edinburgh Castle. (Telephoto image at the top of the page). Both living rooms are equipped with a TV and VCR. Both kitchens have a hob, oven, microwave, dishwasher, coffee maker, kettle, toaster and fridge with freeze box, and a full range of glasses, dishes and utensils. Coffee, tea and sugar are provided for your convenience. Each apartment also has an automatic washing machine/drier as well as an iron, ironing board and hairdryer. 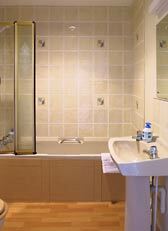 The modern bathrooms have a bathtub with shower above, washbasin, wc, and shaver socket. On the First Floor: 1 twin Bedroom, 1 family bedroom with 1 double bed and 1 single bed. Additional guests can be accommodated on a pullout single bed in the family bedroom and/or the double sofa bed in the living room. See floor plan (right). On the Top Floor: 1 twin bedroom, 1 double bedroom and a small internal single bedroom (no window) accessed through the double bedroom. 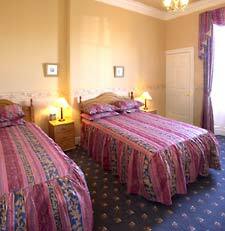 Additional guests can be accommodated on a pullout single bed in the double bedroom and/or a single sized sofa bed in the living room. See floor plan (right). Included: all bed linen and towels, washing up liquid, liquid soap, dishwasher and washing machine tablets. There are no additional charges for heating, lighting or taxes. There is ample free parking available opposite the apartments. Guide prices. Please exact for exact rates. Minimum rental of 3 nights. 10% discount applies to stays of 7 or more nights. 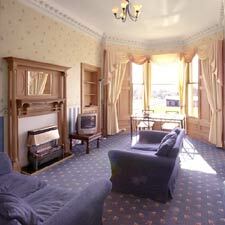 See also bed and breakfast accommodation: Heriott Park Guest House. 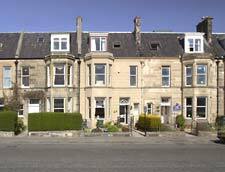 Please tell Stewart you found these apartments in About Scotland!